Last year Art of Tea celebrated its tenth birthday. Steve Schwartz, the company's founder, began his tea career studying at the Ayurvedic Institute in New Mexico. Based in Los Angeles, the company, writes the L.A. Times, "creates custom teas for the likes of Wolfgang Puck, Vera Wang, Hinoki & the Bird and a host of luxury hotels and restaurants". I became aware of Art of Tea when I was approached about a tea review. 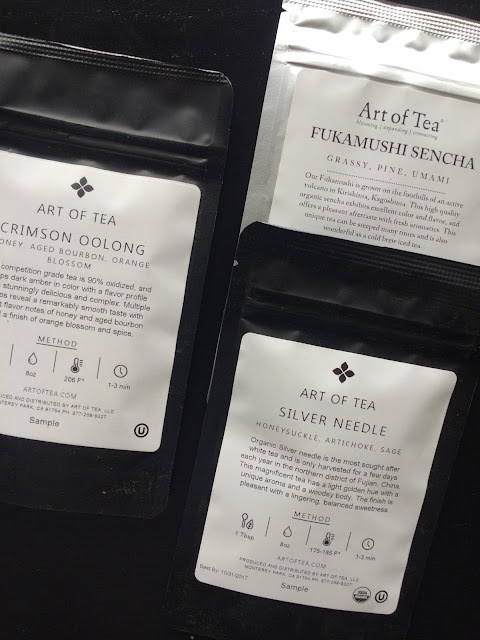 The company sent me three generous samples of Silver Needle, Fukamushi Sencha, and Crimson Oolong. The oolong is my favorite! You'll see why from my tasting notes below. The leaves were small, balled, and dark brown with golden flecks. They smelled fantastic; of cocoa and malt, sweet and floral, as well as something baked. After a cup or two the source of the baked note came to me -- spiced pain aux raisins. I followed the recommended method of 1 tablespoon of leaf steeped in 8 ounces of 206F water for 1-3 minutes. The first infusion of 1 minute was light gold in color and tasted like molten honey. This sweetness was followed by fruity, floral, and woody notes. The mouthfeel was surprisingly light. The second infusion of 2 minutes was a much darker amber color. The liquid was thicker with darker fruit notes as well as cocoa and wood. The sweetness had deepened and was accompanied by a tartness that lingered in my cheeks. The end note was of pain aux raisins and I tasted this flavor in my throat. The final infusion of 3 minutes was not as thick as the second infusion but the flavors remained robust. The tasting notes for this sencha are grassy, pine, and umami. On my first preparation following the recommended method of 1 teaspoon of tea steeped in 8 ounces of 158F water for 30 seconds, the yield was a thin liquor. The next time I prepared this tea I used 3 ounces of water and a steep time of 40 seconds per Ricardo of My Japanese Green Tea's brewing instructions for fukamushicha. This approach produced a grassy, creamy, and nutty tea with a lively green color and lots of particles by the third steep. This tea was more sweet than umami. I did use water that was hotter than 158F. Also, did you know that fukamushi means deep steamed? Again I followed the company's steeping protocol. I steeped 1 tablespoon of tea in 8 ounces of 185F water for 1-3 minutes. The first infusion was light in color and flavor but the second and third (2 and 3 minutes, respectively) were more deeply flavored and fuller bodied. The second infusion was the most aromatic. The official tasting notes are honeysuckle, artichoke, and sage. I know that artichoke is a standard flavor found in silver needle. Maybe what I tasted and smelled was like liquid artichoke hearts if you baked them yourself, not the marinated kind. The herbal note could be likened to drinking the hairs found on an herb like sage. For me, the highlight of these three teas was the oolong. I had thought my next preferred was the silver needle but then I changed my mind after drinking the sencha that had been steeped in less water. Maybe I will change my mind about these two again if I prepare the silver needle differently. For all these teas, I recommend infusing in less water though the dark oolong (90% oxidized) was most forgiving offering lots of deep flavors even in 8 ounces of water. The three teas reviewed in this post were courtesy of Art of Tea.